USA Bests Canada in Gold Cup Opener ~ The Bucky Channel - The World of Sports from Wisconsin's Perspective. When it comes to the Gold Cup, the United States has sort of a knack for winning. At least in the tournament's opening stages. In their last 26 games in opening group play during the CONCACAF tournament, the Americas are on a 24-0-2 unbeaten streak, a streak which continued Tuesday night against Canada at Ford Field in Detroit (Uncle Sam's Army has done alright in the full tournament as well, winning the thing three of the last five times, with Mexico winning the other two Cups). It was a good win for the United States, who had just come off of a 4-0 drubbing to the hands of world champion Spain in a friendly last weekend in Foxborough. While the final in their match against Canada reads 2-0, make no mistake about it, the Americans were in control of this thing for nearly the entire time, so a 2-0 lead may not do the team justice for just how well they played (then again, they only did have two actual shots on goal, with both of them going in of course). 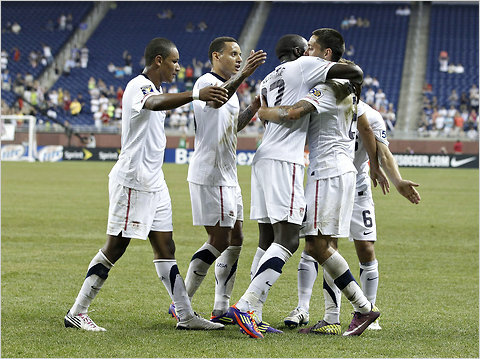 Familar names were able to put the United States on top and keep them there - Jozy Altidore scored in the 15th minute and Clint Dempsey added a mark in the 62nd. Tim Howard was able to keep things clean throughout the game, although not really facing much of an attack from Canada until the games' waning moments. But the goalkeeper put forth a solid effort and kept our foes to the north off the scoresheet. Now personally, I actually didn't get to watch much of this game as I do not have the Fox Soccer Channel as part of our DirecTV package (it's on their highest level of service, which frankly is an unnecessary package to have, and the channel is unavailable in their separate sports pack, a rare DirecTV downfall when it comes to sports). And even if I had access to that channel, or if you currently do, the Gold Cup isn't something you're going to be hearing much about. Don't get me wrong, it's a prestigious tournament, it's just that the masses in America don't seem to care about soccer unless it's the World Cup. It's a shame, too, as these are the same guys playing only a slightly lower level of competition. As always, Mexico will be the top obstacle between the United States and a championship, but the Caribbean nations have been improving and are never an easy out. Elsewhere in the tournament so far Costa Rica has beat Cuba 5-0, Mexico topped El Salvador by the same result, Jamaica topped Grenada 4-0, Honduras and Guatemala played to a scoreless draw, and Panama edged Guadeloupe 3-2. To be honest, Wikipedia's page is the cleanest way to look at all the results and the upcoming schedule. For the Americans, their next match is against Panama this Saturday night. U.S. (Women's) Soccer on Soon! Bucks Survivor: This Thing is Still Going On?